Dubai, 22 September 2008: The Food Control Department at Dubai Municipality has announced the launch of a "Food Recovery Program" which is aimed at distributing healthy, uneaten food from parties, households, commercial kitchens, markets, and restaurants among people in need. Khalid Sharif Al Awadhi, Director of the Food Control Department, said the department is currently working with charity organisations to lead this national effort by coordinating with public and private enterprises in order to rescue thousands of kilograms of healthy, uneaten food in this country that would otherwise be thrown away. "Dubai imports around 85 per cent of the food and we waste an enormous amount of it. Nearly 20 percent of food goes to waste — in, households, commercial kitchens, markets, and restaurants. Even in a society where just about everything is disposable, good food going to waste is unacceptable. This situation calls for us to act immediately," he said. He noted that Dubai Municipality will lead the initiative to collect food and distribute to various organisation who in turn can distribute it to people in need. The type of foods that would be collected will include perishable produce from wholesale or retail sources, prepared foods from the food service industry and processed food with long shelf life. Al Awadhi added that food security or insecurity has been a constant concern for decades but the renewed surge in interest in food security worldwide has seemingly been sparked by the rising food prices. Food and Agriculture Organisation (FAO) estimates that every 30 seconds, a child dies of hunger and every day, 25,000 human beings die of malnutrition. Every day, more than 850 million people go hungry. "In this context, what each country and each individual does is vitally important, but even more important is what we do together," he said. "We would like to reassure everyone that we will be serving only safe food to the people in need and the food control department will take all measures to ensure that food is collected and served safely. The organisations who wish to collect perishable, cooked foods must have proper storage and transportation facilities," Al Awadhi noted. Dubai Municipality has intensified its campaigns at the Fruits and Vegetable Market in Al Aweer from the beginning of the Holy Month of Ramadan as there are an increased number of customers thronging the market. Khalid Sharif Al Awadhi, Director of the Food Control Department in the Municipality said that the Market Unit team in the department had drawn up a special plan for the occasion, which witnesses increased number of visitors in the market. He said that the team's plan include intensified inspections in order to cover all points of sale of fruits and vegetables in the market, especially the open areas where retail sale of fruits and vegetables are conducted. "Daily inspections are conducted to ensure that the fruits and vegetables are offered properly and safely. In addition, it will be ensured that all foodstuff establishments and Bastas comply with the approved hygiene rules and specifications," said Al Awadhi.He said the working plan of Ramadan also include complete cleaning operation in the open areas. "The unit in coordination and cooperation with the Waste Management Department washed the whole open areas after informing all companies to take out the fruits and vegetables that were displayed outside the Bastas until the cleaning operation is finished effectively," said Al Awadhi. DUBAI, UAE, 4th September 2008 – With the announcement of the phased opening of Terminal Three [T3] from 14th October, the spotlight has now turned firmly on Emirates’ much-anticipated move to its dedicated new home in Dubai. EK843 Dubai-Doha, an Airbus A330-200, will be the first Emirates flight to be flagged off from the new terminal. In a carefully-orchestrated move, the first phase of Emirates’ operations from T3 will launch all flights to the GCC* and the Americas – 40 flights a day, around 15 per cent of the airline’s total services. Phase Two will include flights to the rest of the Middle East and Africa as well, increasing operations to 99 flights every day, 37 per cent of all flights. Flights to Europe will take-off in the next phase, escalating operations to 168 daily flights or 60 per cent of all Emirates’ services. The fourth and final phase will include flights to the Indian Subcontinent, East Asia and Australasia and bring the total to 269 flights every day. Each phase will commence after receiving a “clean operational chit” from the previous one to ensure customers enjoy a smooth, seamless Emirates experience. Trials and testing at T3 continue at a feverish pace to iron out operational creases and remove any system bugs before the soft opening. The next major passenger trial is scheduled for 27th September. With a total built-up area of 515,000 m2, the gargantuan terminal has more than 250 check-in counters at Departures including 126 for Economy Class passengers; 32 for First and Business; 60 Self Service Kiosks both with and without baggage; 10 dedicated counters for Skywards premium members; and best of all, 18 counters for outsized baggage located right in the car park. Emirates has designed an entire floor of luxurious, themed lounges in the 10-storied concourse for its premium passengers, with a capacity for more than 2,000, serving the finest international cuisine and offering full-fledged spa facilities. Lounges for unaccompanied minors and special needs passengers are specially-designed to take the stress off travel. Passengers at T3 will be spoilt for choice when it comes to food and beverages – from coffee shops and fast food to seafood and tapas – this airport has it all. And then there’s the duty free and retail shopping meandering a course of 15,500 m2, running the gamut of top brands worldwide, and designed to satisfy the palate of the most fastidious of shoppers, from fashionistas and gizmo-lovers to bookworms. From this month, Emirates and its travel trade network will proactively inform passengers of the change in the Terminal, which will also be reflected in the reservations and ticketing systems and channels. * GCC – Gulf Cooperation Council [Bahrain, Oman, Kingdom of Saudi Arabia, Kuwait, Qatar, and the UAE]. Dubai, 31 August 2008: Dubai Municipality will soon open to public the Coins House, a dedicated museum for nearly 500 ancient coins that were in circulation in the region since time of the Islamic caliphates. The fifth room comprises of 45 pieces of coins from ancient Egypt, the region previously known as Belad Al Sham, and Turkey during the rein of the Tulunids who were the first independent dynasty in Islamic Egypt (868–905 AD), the Fatimid Caliphate that ruled over varying areas of the Maghreb, Egypt, and the Levant from 5 January 909 to 1171, the Mamluks, and Othamia Caliphate. 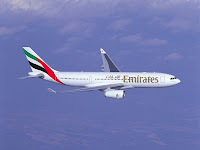 DUBAI, U.A.E., 1st September 2008 – This month, Emirates Airline will operate 47 extra flights from Dubai to Jeddah, in a move aimed at facilitating travel for the millions of pilgrims visiting the Kingdom of Saudi Arabia during the Holy month of Ramadan. These additional services, starting from today until 15th October, can be accessed by travellers holding a valid Umrah visa. Those wishing to travel to the kingdom for reasons others than Umrah can fly on any of Emirates’ regular, scheduled flights that operate 17 times a week from Dubai to Jeddah, Riyadh and Dammam. These extra flights will depart Dubai at 0900hrs and 1245hrs local time, providing Umrah passengers with more flexibility, and ensuring convenient connections for pilgrims arriving from around Emirates' global network, especially from the Indian sub-continent, and the Far East. Adnan Kazim, Emirates Senior Vice President, Commercial Operations, Gulf, Middle East and Iran said: “The Umrah is a unique spiritual experience for Muslims, and Emirates is glad to be able to facilitate travel arrangements for scores of pilgrims during their special journey, through services in the air and on the ground. Emirates would like to thank the government and authorities in Saudi Arabia for granting it the permission to introduce extra frequencies for Umrah pilgrims." UAE-based travellers can call (04) 214 4444 or email at hajandumrah@emirates.com to receive information on flights, book their travel, request special services, or make changes to their travel itineraries. Alternatively, bookings can also be made through preferred travel agents. Likewise, the hotline number 800-8-971-487 will operate round the clock and is toll-free to Emirates passengers calling from Jeddah, Makkah and Medinah. Dubai, September 2, 2008- To celebrate the holy month of Ramadan, i2 extends its partnership with the United Nations Children’s Fund (UNICEF) and will be running a charity campaign starting today to support UNICEF’s continuous humanitarian initiatives. For a period of six months, i2 commits to donate US$ 1 to UNICEF from the sale of each mobile phone at i2 retail outlets in eight selected markets. The campaign will run in KSA, UAE, Egypt, Kuwait, Jordan, Tunisia, Iraq and Sudan. The money raised will be used to help underprivileged children in the Middle East and Africa with emphasis on Egypt, Sudan and Iraq; by providing basic health needs crucial to their survival. This endeavor follows the success of i2’s partnership with UNICEF during the holy month of Ramadan last year which raised $100,000. This year, i2 is hoping to raise a significant amount by the end of the campaign to generate maximum awareness by helping deprived children in the Middle East and Africa with the necessary medications, vaccines, clean water and food. Founded in 1993 in Saudi Arabia, i2 is the region’s largest and most diverse mobile phone provider. Over 2676 employees across 340 stores in 22 countries are dedicated to providing i2 customers with technological solutions and services that enhance their lifestyles and shopping experience. i2 stores offer the widest range of mobile phones, PDAs, wireless technology, software; value added services and mobile accessories in the region. It is the first mobile phone provider to offer its customers a life-time warranty and a comprehensive after sales maintenance program on all products purchased in store or online. To better serve their customers, i2 has expanded its reach to include i2 magazine, i2 club, i2 café and other innovative support programs. For more information about i2 products and services please visit http://www.i2-mobile.com/ . i2 operates in: Andorra, Angola, Bahrain, Cameroon, Egypt, Ghana, Iran, Iraq, Ivory Coast, Jordan, KSA, Kuwait, Lebanon, Morocco, Pakistan, Reunion, Senegal, South Africa, Sudan, Syria, Tunisia, and UAE.